The subway isn’t a scene in its own right, as much as an adjunct to other scenes. 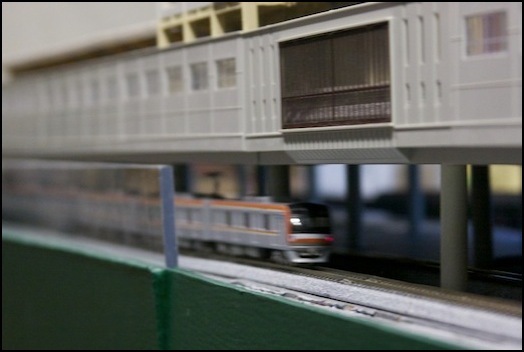 On the Urban Station scene, it’s a set of ground-level tracks and platforms under the elevated station. 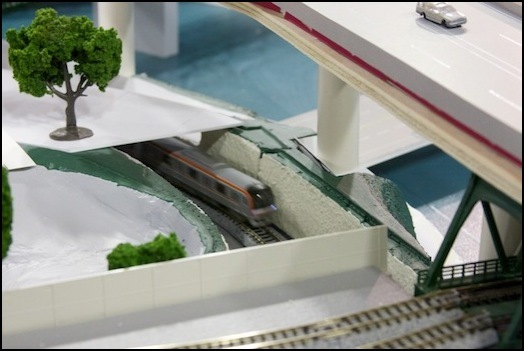 On the Riverside Station scene, it’s an underground station (Kawate Station) below the Express/Shinkansen tracks at the front of the scene, with windows to let you view the platforms. Trains can cross from the “commuter” loop to the subway loop (both are double-track continuous loops) using the two diverging tracks at the above-ground Commuter Line station. This is easier to understand if you look at the track plan. There are also some Subway Design notes in the Layout Design section, details about the way I made the tunnel roof in the Subway Cover page of the Layout Scenery section, and more photos can be found in the Subway photo album. For information about the trains that will operate on this line, see my Subway Trains page in the Collection section. A Tokyo Metro 1000 Series subway train makes the inaugural run along the Subway line tracks below the Urban Station. 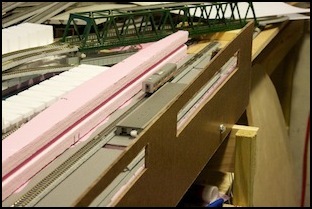 In the Urban Station scene, the subway runs on the surface, underneath the raised station. Next to it (not shown here) is a station for the local light rail (tram) line. 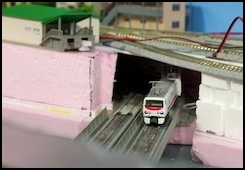 In the Riverside Station scene, the subway briefly pops into view crossing the river, and then enters an underground station. 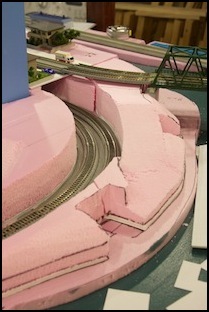 The station can be viewed through two cut-outs in the front of the layout. Above it run the tracks for the Express line. The train waits inside Kawate ("Riverside") station. Note: the station is using Kato’s new-style 23-107 and 23-108 tiled platforms and the long, square, 23-109 ends (see the Passenger Platforms page for more photos of the various elements), as well as the new 20-875 concrete-tie single-track 248mm straights (on the visible front track). Lighting is using LED Strip Lights, with a mix of "white" and "warm white" LEDs to give a "fluorescent light" look (somewhat blue, but not the "daylight" blue of the "white" LEDs alone). Students waiting for their train kill time at the vending machines.